Train—and keep—a child welfare workforce that will make a difference! 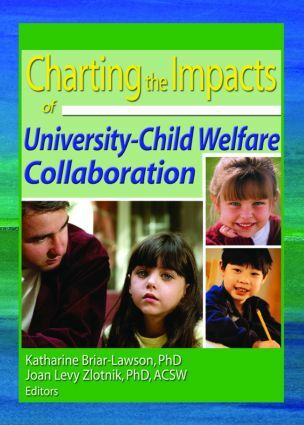 Charting the Impacts of University-Child Welfare Collaboration addresses the challenges of implementing workforce development initiatives designed to recruit students into the public child welfare field. Edited by Dr. Katharine Briar-Lawson, Dean of the School of Social Welfare at the University at Albany in New York, and Dr. Joan Levy Zlotnik, PhD, ACSW, Executive Director of the Institute for the Advancement of Social Work Research, the book reflects the ongoing effort to counteract the “de-professionalization” phase of the 1970s and 80s that has impeded child welfare service delivery. A panel of practitioners, educators, and researchers focus on training and administrative funding, collaborative practices, delivery of educational content, preparation challenges faced by educators, and future challenges.